Crete is a magical amalgamation of everything that is worth calling “Beautiful”. Entailing glittery beaches, sturdy bays, beach-bar along with excellent nightlife, Crete is the largest island in Europe. Hunt on the reasons why you should travel Crete this summer. Diving in the blue and swimmable seas is an ultimate fun for every traveler heading to Crete. Who can resist themselves from dazzling mountain ranges, thrilling water-action along with serene locations? There are a bunch of entertaining activities in Crete that can keep you busy for long. History buffs would love visiting the ancient Palace of Knossos to extract the learning about the history of Crete. Meanwhile, those sun-seekers can head on to the long sandy beaches. Outdoorsy people can trek and tour as long as they want at Samaria Gorge in Chania and shopaholics can shop till they drop at trendy boutiques of Agios Nikolaos. Crete is one of world’s family friendly destinations that offers freshly prepared baby food, children’s buffet, and a spacious spa treatment particularly for children with chocolate facials and fun-filled “Mummy and Me” pedicure sessions. There are mini bikes and cars, water activities, boat trips, tennis and treasure hunts as well that are particularly meant for children. 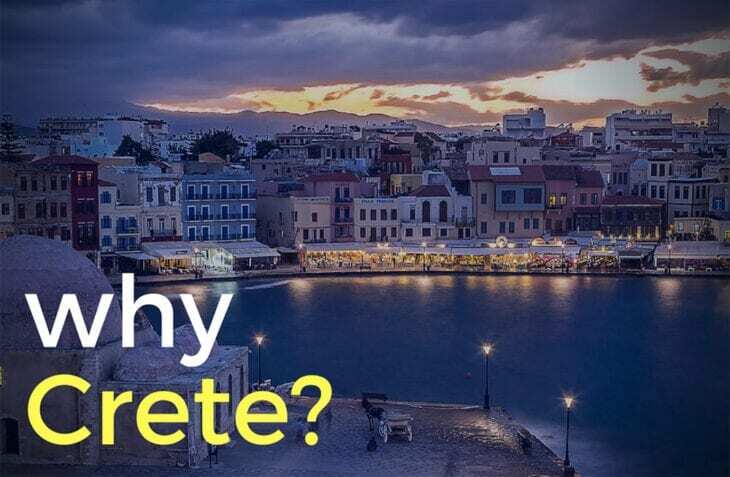 Crete is certainly the most popular travel destination for an ideal getaway, be it with family or friends. This sun-drenched European island has the one of best climate in Europe portraying magical tapestry of rough and sturdy mountains with clear blue seas. Smell the scents of wild herbs, taste the freshly-picked fruits straight from the farm, witness the exuberant wildlife, toothsome cheeses and the world’s best olive oil. Sip and swirl with a Greek Coffee on the pavement in the mountain village. Here you can view enthusiastic yet endless events, occasions and weddings, the rich Greek history, the locals and travellers from all around the globe. Crete has turned into a pure bliss for historians and archaeologists, curious enough to know everything about the world. Greece’s Famous Culinary Festival is held annually by Domes of Elounda and serves as one of the prime attraction for the visitors. It starts on June 26th every year, an assortment of renowned chefs provide exceptional and flawless dining experience during special dates. It’s an astounding combination of haute cuisine and Grecian specialties that are must-have for visitors to treat their taste buds. The locals are welcoming and portray conventional hospitality once you step on this splendid island. Moreover, the local customs and culture imparted in the food, music, art and crafts are mainly the things that attract visitors from the world. Since it is the counted amongst one of the largest Greek Islands, it offers fully developed yet exquisite tourist attractions with lavish hotels, sandy beaches, serene bays, bracing mountain villages and plateaus that are enough to satisfy the insightful traveler. While exploring this majestic island, you will come across miraculous moments, those perfect blends of your time and the island itself which will reward you with the best and unforgettable experiences. Gazing at the wondrous attractions on Crete Island, don’t miss out Heraklion. Brimming with hip and trendy cafes and shopping places, exceptional archaeological museums, Heraklion holds plenty of mini treasures that are waiting to be discovered by you. Moving on to Chania, you can walk through the luxurious Venetian Villas that are now transformed incredibly into lavish hotels. Moreover, you will be surprised to see that much of the rich Venetian History is intact. The dazzling Venetian Harbour entails amazing shops and eateries that are lined right on the street along with small sized hotels placed in the archaic buildings that once served as home to émigrés. View the majestic castle situated in Rethymno that speaks volumes about the rich history. Add the beaches, cafes and eateries in your must-go-to list for sure. Though Sitia is considered as a quiet and calm place, but it still offers the locals and visitors the sights of shimmery beaches, distinct cafes along with numerous hotels to stay. This is how Crete is packed with bountiful treasures and destinations such as Zakros, Keratokambos, Anogia, Zaros, Chora Sfakia that are smaller in size yet it offers such sense of tourism that is incomparable. Every corner of Crete offers a mesmerizing experience to all the travelers and a special treat for those who are searching for peace and tranquility to ease their busy schedule for ideal holidays. There is much more to explore in Crete at every step you take. Stroll in the bunch of villages and little towns on the island. Whatever you mood you are in, there are some charming and unique places that will take away all your pain and stress and will switch you to a happy mood for sure. Stroll, climb, drive or ride across the magnificent plateaus, spectacular mountain ranges and seascapes. Discover this stunning island and find out “the Crete you wished for”. Generally, the climate is ideal most of the year but most of the visitors make their way to this gorgeous island in April till October. Crete grows out quite sunny or at times cold enough in March, that you might need to wear a cardigan or lay on the bed with warm blanket at night. That time of the year, Crete is not much crowded but still magical. In fact, more people venture in to the Island for sunny and dramatic getaway typically in between April-June. Plan out a trip to Crete this summer vacation and visit the special attractions while churning out unforgettable moments of life that will make you crave for stepping on such worthwhile island once again in life. Lose yourself in the exquisite Greek houses and cobbled streets while diving into centuries old history of Greece. Every door you pull here will shower you with unexpected and endless amazement. Offering snowcapped peaks, olive groves and deep gorges, cragged Crete provides a mesmerizing escape to all those travellers who wish for an ideal getaway. It is a diverse blend of picturesque landscapes and holds bits of nostalgia of other parts of the Greece, yet on the whole it has its own unique and distinct culture. In addition to this, you can view the combination of both fertile coastal areas and rugged mountain and landscapes. Moreover, Cretans are known for their conventional music, healthy-home cooked food and great exhibit of hospitality to locals and visitors alike. For all the beach lovers, Crete isn’t short of stunning beaches but one of the most popular is Elafonisi. It is located on the west of this fantastic Island and known for its shimmery pink and pearl white sand. The two nearby places that are worth visiting includes Chrysoskalitissa monastery and Agia Irini lighthouse. Crete has a perfect blend of picturesque coastlines, spectacular mountains and little villages that serve as the perfect backdrop for any Hollywood block buster. If you have not stepped in to Crete yet, plan it out this summer and discover the fascinating Greek Island. It will certainly capture your heart. The scent of orange blossom and jasmine, a big chunk of cool red watermelon and a glass of chilled raki is flattering enough to visit it once again. Satisfied enough? It’s time to get on your feet and plan out a vacation to this incredible and distinctive island right now. This entry was posted in Chania, Crete Attractions & Tips, Heraklion, Lassithi, Rethymno on June 26, 2016 .